Every bride-to-be runs into a wedding planning flub or two, but the trick is to make sure you bounce back the minute you encounter one of these pesky bumps in the road. Here are some common wedding planning flubs and how to avoid them. You lose/gain a few inches in between dress fitting appointments—Between stress, new diets, and different exorcise routines, it’s not uncommon for brides to gain or lose a few inches during the wedding planning process. If this happens, don’t panic. The seamstress can usually take in your wedding gown to accommodate the inches you lost easier than letting it out to account for gained inches. Either way, if the change is drastic, your seamstress or dress maker can figure out a way to alter your gown accordingly. For tricky customization in the event of excess weight gain or loss, though, be prepared to pay more in the way of alteration fees. 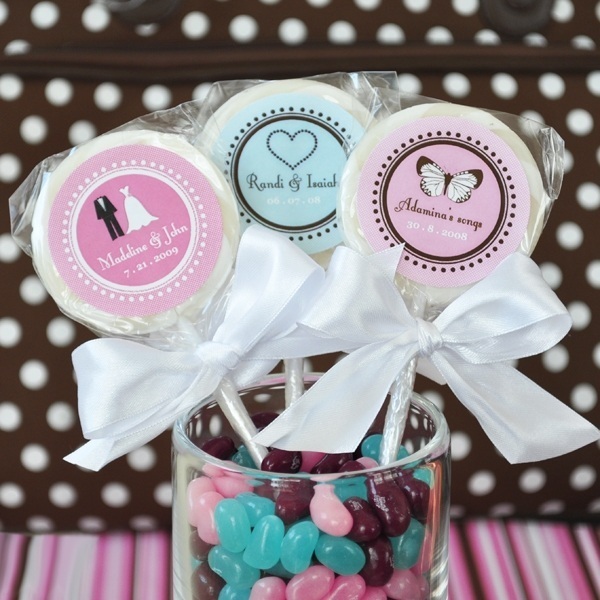 Cute pink & blue personalized wedding favors. You have to change the menu items at the last minute—Whether you learn that many of your guests have similar food allergies or the caterer cannot get their hands on the materials for your dish of choice before the big day, there are many reasons you might have to change menu items at the last minute. If this is the case, meet with your caterer and plan an alternative that still offers the flavor and presentation you want. The changes might involve something as simple as substituting a spice or type of cheese. 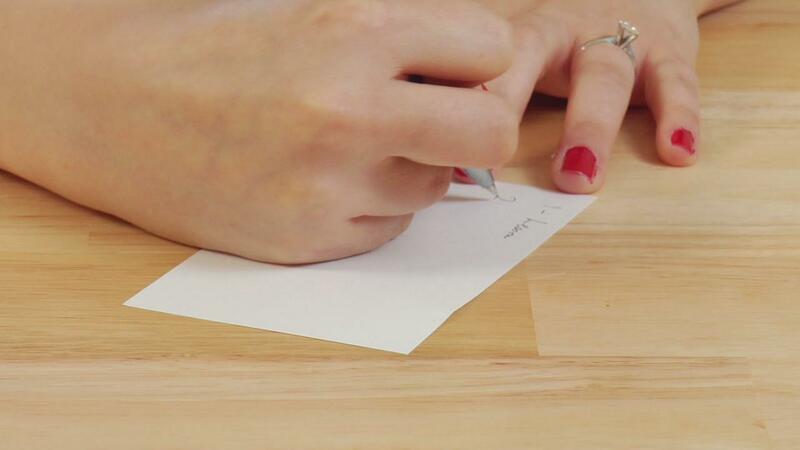 You send invitations out too late—If you order your invites too late or push your luck and send them out too late, consider dropping everyone on your list a line to let them know the invitation is on its way and thank them for their RSVP courtesy on such short notice. Sending out invitations at the last minute is one of the most common wedding planning flubs brides run into, but the situation can usually be easily remedied. You forget the favors—You need to wait for your RSVP’s before ordering favors and then before you know it, your wedding is right around the corner. That’s ok! There are tons of great options that arrive in a week. Personalized favors that can be found and delivered within 2 weeks! It’s a small world. Take some time to browse, you will be surprised the options you will find. The key is not to worry and get all Bridezilla. Stay calm. These flubs tend to have a way of working themselves out. More and more brides are skipping expensive wedding invites in favor of Facebook clicks. 15 days before their wedding, Donna “Cheap” Turner and Mason Sigman decided to add “mass blast a Facebook invitation” to the to-do list. Turner, 40, who grew up in Coral Springs and lives in Denver, CO, said she reserved old-fashioned fancy wedding invitations for the older more traditional family guests and used Facebook wedding invitations to invite, well, everybody else. One advantage is you instantly know who is coming and who can’t. People can even tell you why they can’t come and post on your wall positive messages. If someone hasn’t responded you can take the time to privately message them to find out. Though a wedding is typically the most formal event of a lifetime, informality and social media are taking the place of tradition and embossed stationery, experts say. Facebook invitations may not be elegant keepsakes — they are as fleeting as any online page — but they are more economical, immediate and environmentally friendly than the Postal Service variety. 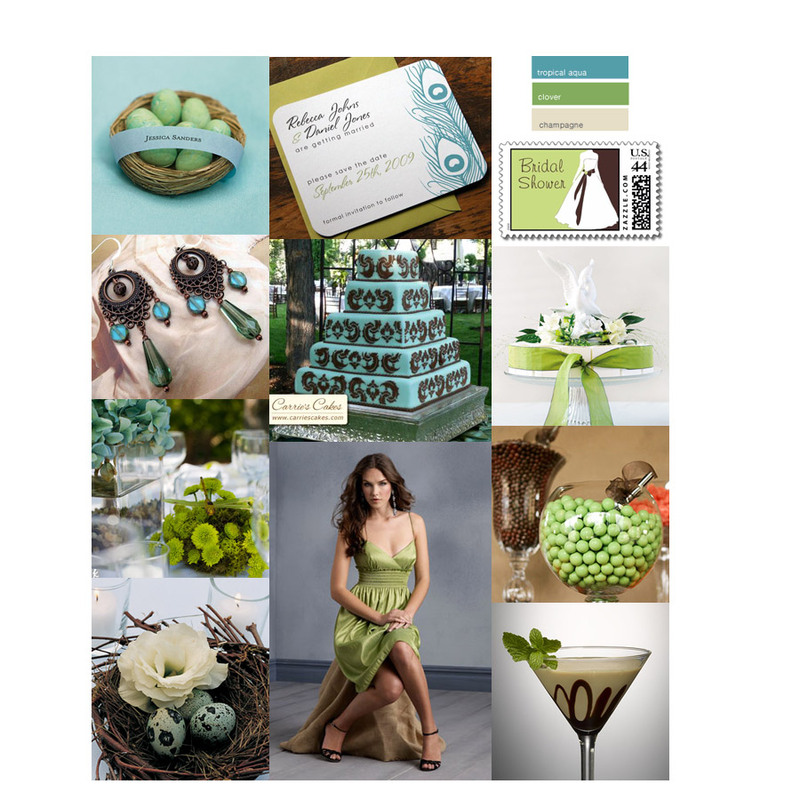 “Anything digital is becoming the hot new trend,” said Leslie Jenkins, the author of http://weddingengagementnoise.com. This fad has its critics, who say Facebook is too casual for inviting people to a highly significant event. They critique it as impersonal and, when it comes to tone and propriety, slightly off-putting and tacky. Of course, “those people” are probably making money of the old fashioned invitations. Are paper wedding invitations necessary anymore? The more I think about technology the more I question the traditional practices surrounding weddings. Do we really need to buy “Save the Date” magnets when you can send out an Evite to everyone on your friends list on Facebook and by e-mail? I mean, I guess sending out modern wedding invitations might keep your mom happy BUT do we need it? Over at Huffington Post, I was reading a great article that stated, “Is social media killing simple etiquette?” This seems to overflow to traditional media like RSVP’s for wedding invitations sent by snail mail too. In fact, more than 80% of personal invitations and personal e-mail requests receive no response at all. They are simply ignored. While browsing around hoping to find something funny that people do in weddings today I ran across some funny wedding invitations I had to share. This first example is designed for the couple that has lived together for years and even has kids. It makes light of the fact that the kids were definately born out of wedlock. 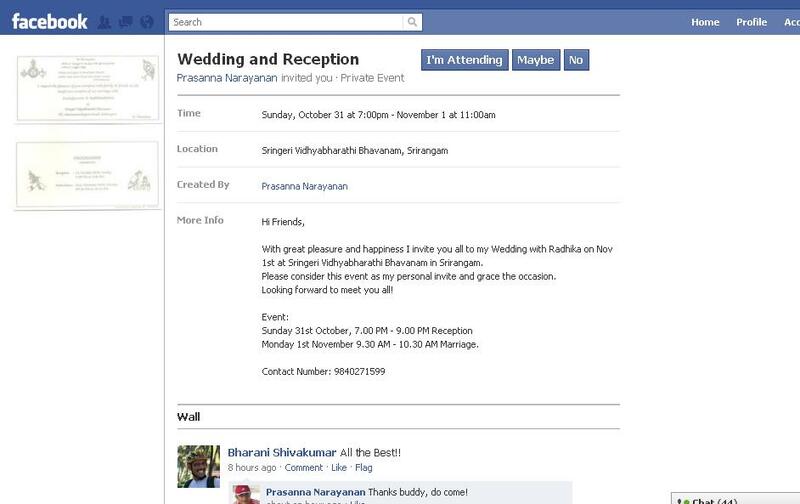 No doubt this is an example of a modern wedding invitation. Here’s some advice on things to think about when sending out wedding invitations that involve children. First of all, a wedding invitation “assumes” no children are invited UNLESS invited explicitly. Also, the only sure fire way to prevent having a screaming baby in the middle of your ceremony is to provide a free nursery (easy if at a church) and tell the guests children are allowed BUT must be kept in the nursery during the ceremony. If the children are older teens (say, 16 or older), you might want to send them an individual invitation, just like you would an adult. This makes them feel more like an adult and allows them the oppurtunity to deny the invitation seperately if they are’t able to go even if their parents go. If they are over 18 then proper wedding etiquette requires a seperate invitation. 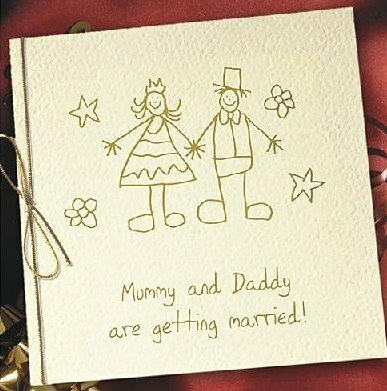 If you don’t want to include children at the ceremony, don’t add their names or “and family” on the outside of the envelope. Although this violates the stricter laws of etiquette, you might even add something like, “Sorry, but children are not invited”, “adults only” or a similar phrase to clarify. If you want to have children at the reception but not the ceremony, you could note this on the response card … or on the invitation itself at the bottom. While not necessary, you may want to include your children particularly if you will have a part of the ceremony devoted to them. I’ve also decided to do a post later on the funniest wedding invitations I’ve seen. Look forward to that another day.